If the lack of snow has you looking for something else to do this holiday weekend, perhaps you might wish to play golf … indoors. The Mammoth Rock ‘n Bowl has three golf simulators upstairs from the bowling alley. There are 27 courses to choose from. Depending on the day and time, rental rates can range from $20 to $40/hour. Rock ‘n Bowl employee Greg Bokenkamp said two people playing at a decent clip can finish 18 holes in about an hour and a half. In what is no longer the offseason, Sierra Star Golf Course Asst. Pro Greg Bokenkamp moonlights as an employee at the Rock ‘n Bowl’s golf center located on the 2nd floor. Photo courtesy: Lunch. If you’re wondering how realistic the simulators are, I took about seven swings and couldn’t hit the par three green – extremely realistic. Rock ‘n Bowl Owner Dan O’Connell said that when former Sierra Star Asst. 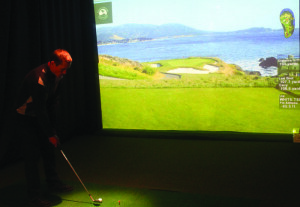 Pro Ian Birrell heard about O’Connell’s idea to open a bowling alley, he called to pitch the idea of installing golf simulators. O’Connell was so taken with the idea that the upstairs was redesigned to add nore space to accommodate them. The simulator rooms can also be rented out by private parties who might wish to watch football on the projection screens. Birrell, now an Assistant G.M. at the Rock ‘n Bowl, sent out an email this week announcing that golf leagues would begin the Tuesday after Thanksgiving. There are Ladies (Tuesdays), Mens (Wednesdays) and Mixed (Thursdays) leagues. Each league has a twelve team (24 person) maximum. Cost is just $10/week or $50 for the five-week season. Sign up at the Rock ‘n Bowl golf center.